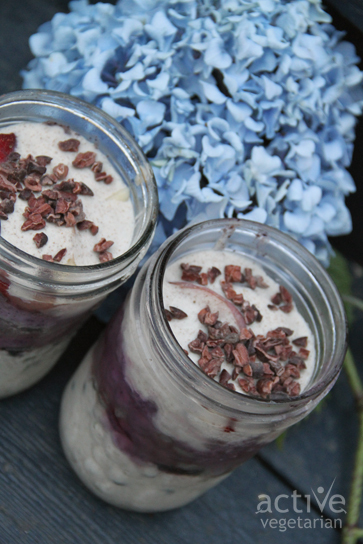 This Vegan Berry Parfait is a creamy and dreamy our take on normal yogurt based parfaits. 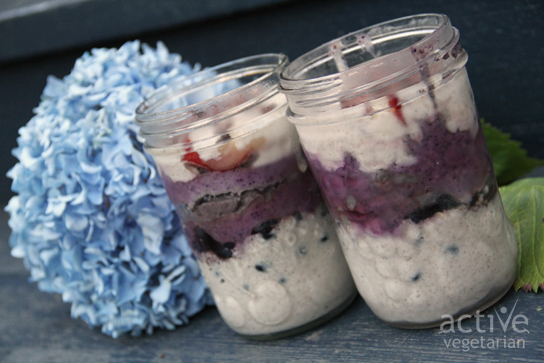 This mix of blueberries, strawberries and coconut satisfies all cravings and leaves you energized! Blend the coconut milk, cashews, chia seeds, agave, vanilla, and cinnamon in a high speed blender till very smooth. Transfer half of the mixture to a container. Blend the other half with 1 cup blueberries. If it’s too thin, add another tablespoon or two of chia seeds. You now have two puddings: one white, one blue! Stick them in the fridge for a few hours to thicken up. After the puddings thicken, set up 4 small mason jars or glasses. Layer a small amount of the white pudding in the bottom of the glass. Add a generous layer of blueberries and strawberries . Now layer on some of the blueberry pudding. Top it off with some of the white pudding and a sprinkle of goji berries, buckwheat, cacao nibs, granola, or another favorite topper. Make sure to use even amounts of the puddings as you go along, so as not to run out! When you finish the process, serve the puddings cool. They keep nicely in the fridge for at least a few days. During the week, you can just grab a jar from the fridge, and a small container of nuts or granola and we have a pre-made, convenient, but very healthy breakfast.